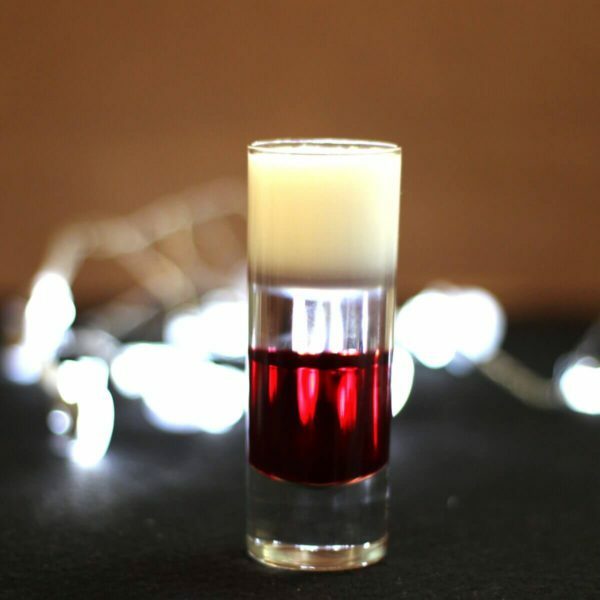 The Love Bite cocktail is a layered shooter, like the B52, only more fruity and less sweet. It blends cherry and orange liqueurs with a bit of cream to give it some richness. And yes, it does have a little bit of a bite, in the tart edge of the cherry and orange. This is a fabulous drink for dates, but it’s best served in a more intimate setting. Rather than recommending it at a bar, save it for when you get home. 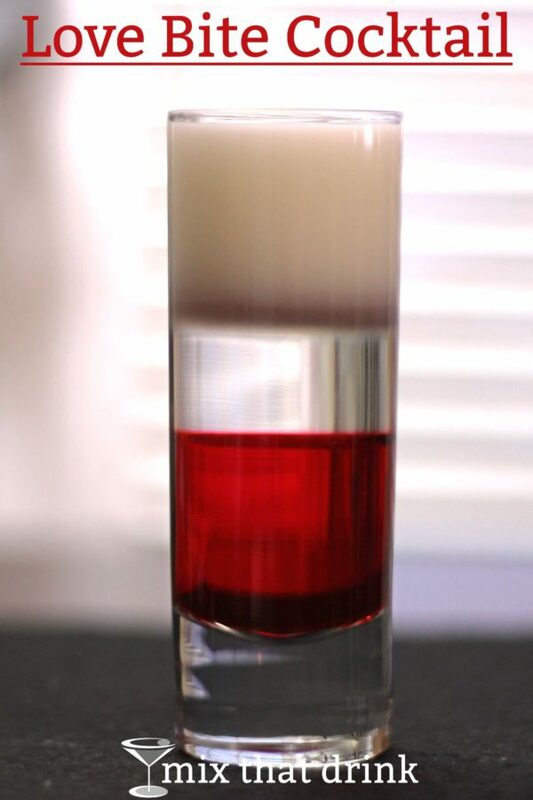 Part of the splendor of a layered shot is in the pouring and serving. It’s not an easy trick, but once you get the hang of it, it’s such a great way to impress a guest. I’ve got a tutorial on how to layer cocktails here, or there’s a video at the end of this page. In addition to the spoon method I outline in that tutorial, you can also get cocktail pourers that attach to the tops of your liqueur bottles and help you pour more slowly and smoothly straight from the bottle. Those help a lot with layering. Another option is to pour the spirit into a small measuring cup, and pour from that over the spoon. You can use pretty much any red cherry liqueur, and any clear orange liqueur. Grand Marnier’s orange-red color could clash with your cherry liqueur, and Blue Curacao would turn it into the American Flag. Which type of cream you use also matters, since this is a layered drink recipe. I used light cream – or single cream, as it’s called in Europe. And since some parts of the US don’t offer light cream, I would suggest half-and-half for them. Pour the cherry liqueur into a cocktail glass (not a shot glass). Layer on the orange liqueur. Top it with a layer of cream. Serve. I used light cream, which isn’t available in the western part of the US (last I heard, anyway). I think half and half would work, too.